Passwords How To Automatically Change Passwords With New LastPass And Dashlane Features How To Automatically Change Passwords With New LastPass And Dashlane Features Every few months, we hear of a new security vulnerability that requires you to change your password. It's tiresome, but now Password management apps are adding tools to automate this task, saving you time. Read More are a tricky beast. You want a password that you can remember, but you also want to make sure it’s secure. How do you find the balance? One option, is a password manager, and it’s a great option. But if you insist on keeping track of your passwords manually, using tricks that only you can remember. If you can’t decide which method to use, of you just want some general tips, we’ve got you covered with this awesome infographic. 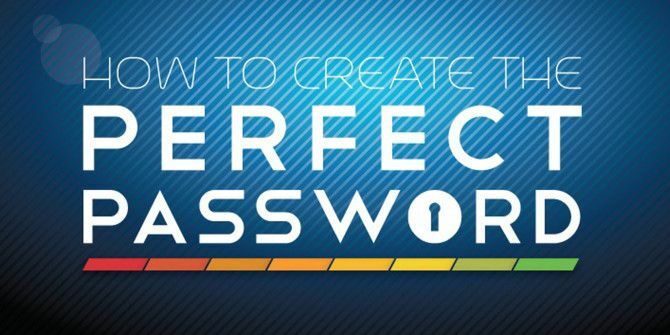 How do you keep your passwords secure? Any tips to share? Explore more about: Infographic, Password. This infographic is weak. It duplicates itself in the first section, and contradicts itself in the second. According to the infographic an 8 character password will take two years to crack, but a 10 character password will only take a week, and this in the section that says to go with a longer password over a more complex password. Another very weak password habit, is using the same password across multiple services - worse still if you use the same password in a place you would expect strong security and in somewhere less conscientious about security. Another point, of course, passwords that can be reset by email are only as strong as your email password. Of course, another burning question - if strong passwords are required, why is a 4 digit PIN good enough - because the PIN cannot be attacked remotely and requires that the card has already been compromised. The most common form of password cracking is to grab a copy of the encrypted password file (due to poor settings, trojan attack etc.) and then crack at your leisure. SafeInCloud is also a simple and efficient password manager with good integration for your mobile device, browser plugin, and stand-alone app for computer. If you want to create passwords without the hassle of using password manager, then you can use SuperGenPass for the job, which is available on Android and as a browser bookmarklet. Dashlane is a terrific PW manager, and has a new feature that is in beta: ability to change ALL of your PW at once, by pressing a single button. You could change all of your PW as often as you wish. Would this not be a security system game-changer? +1 for Dashlane with 2FA! Also a shout out for PasswordBox which supports not having to use a custom browser or copy and paste passwords on Android. Dashlane is not free, but it is worth it. I'm using avast! which does not appear to like it, but I'm unsure why. I keep using Dashlane because of its excellent encryption. My tip for regularly changing a password (say, your password manager master password) while giving yourself the best chance of remembering it is this. Starting with the one you use now and know well, change just one letter/character/case and carry on using the new one for a month, then repeat this, changing a different character each month. After a year you will still remember the current password but will be hard pressed to remember the one you started with. This does not solve the problem of remembering different complex passwords! A simple 'formula' can produce extremely complex passwords. 28 03 64 a well know number, date, phone... here it is the dd mm yy of my sister birthday. a sequence of special characters, always identical in every password and always inserted at the same place. This procedure is easy to remember, can be easily customize to your own ideas, values... use different special characters, numbers, the letter used based on the URL. It allows to create complex passwords for all the sites. For sites rejecting one of your character, replace by a simple one, eg. always z or K whatever. You have won my Comment Of The Day award! 10 points to you. A longer sentence with punctuations will always be the safer and easier to remember than a shorter string of "special" characters, which you'd forget immediately after creating. Check out https://howsecureismypassword.net/ and compare "Constraint less password right here" with anything else.